Instead of thinking of tidying up as a chore, consider that you are simply putting your best foot forward. Those who open the door to regular homebuyer visits must keep their homes in ship-shape. With that mindset, it’s easier to do simple things like scooping up newspapers, putting away the breakfast dishes and wiping down the dining room table. “Create the showcase space you want to come home to everyday,” says Marni Jameson, a syndicated columnist and author of “House of Havoc” (Da Capo Lifelong Books, 2010). To avoid a bad case of ‘grungy kitchen,’ start every meal prep by emptying the dishwasher so it’s ready to fill. Then, before you start cooking, keep the sink filled with hot water and dish soap. “As you finish with a utensil or a pan, drop it into the sink to start the cleaning process,” suggests Linda Cobb, author of the New York Times bestselling, “Queen of Clean” book series (Pocket Books). In addition, use a spoon rest to keep dirty utensils and food from spilling all over the counter. To keep clean-up tasks from piling up, add some daily chores to your routine that aren’t too hard to follow. Making the bed right after waking up and putting away your toiletries right after using them are simple goals to start. Always hang towels up and put toilet lids down. “If something needs sweeping, wiping, washing or folding, do it that minute, so nothing snowballs,” Jameson says. Since this room can get really messy – fast – stay on top of it by keeping a microfiber cloth under the sink and using it daily. “Before you leave the house, wring the cloth out in warm water and wipe all the sink surfaces and faucets,” Cobb suggests. In addition, make sure everybody has a place to hang up towels and washcloths and use baskets under the sink to store hair styling tools and products. If you can’t thoroughly clean a room, don’t despair. Spritz a favorite home fragrance or light a candle. 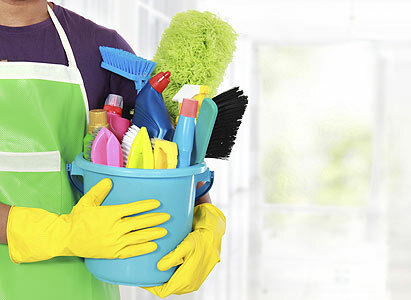 “If a room smells clean, you’ll feel less stressed that you haven’t had as much time to clean it,” says Leslie Reichert, author of “The Joy of Green Cleaning”. If your living room is filled with a mishmash of Legos, magazines, and DVDs, consider purchasing a basket (or two) to keep that room looking neat and organized. “I like baskets that are large enough to hold everything,” Cobb says. The next time you clean a room from top-to-bottom, take a picture of it in all its sparkling glory. This photographic evidence is especially helpful if you want your kids to pitch in and clean up. “A photo helps moms show their children how the room should look when they tell them to ‘go clean their room,’” Reichert says.